Rats and mice running around your house can cause many problems if you don’t catch them early.They carry as many as two dozen diseases that can make you ill, and they contaminate every surface they touch with feces and urine. Rodents also destroy food items, building materials, clothing and other items in and around the home.Rats scurry around in attics, basements, sheds, behind appliances and furniture and in food cupboards or just about anywhere. Fortunately, there are several effective mouse traps available to help you control and get rid of them from around your home. A mouse trap is a mechanism persons use to kill or trap mice. Apart from mice, some traps are designed to trap larger rodents like rats and squirrels.Some varieties include jaw traps, spring traps, snap traps, glue traps, live traps, and electronic traps. You can also make your own trap from recyclable materials around the house. Most traps use traps work to catch mice or kill them on contact. Humane mouse traps let you catch mice without harming them so that you can release them into the garbage or areas far from your home. Let’s explore how each type works. Jaw mouse traps are sturdy, yet lightweight plastic traps that operate by spring coils. The coils trigger the jaw mechanism to catch mice.You place the bait into the jaws of the trap. When the mouse reaches for the bait, the spring snaps the jaws shut, killing the mouse instantly.Jaw mouse traps use significantly less force than regular spring traps and are safer to use and set up. They won’t snap your fingers and are affordable, and highly effective in trapping mice. Most snap traps are either of plastic or wood material and are reusable. These traps operate by spring coils or levers which snap into place when mice move onto the trap. Users allow a small opening big enough for mice to get in but not get out. They are humane traps since you don’t need any bait or toxins to trap them. You simply release them in another location rather than killing them. Snap traps are safe and hygienic to use, and pets and small children are safe around them. However, make sure the hole in the trap is not wide enough for kids to push their hands inside. 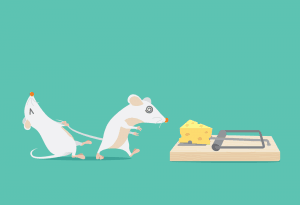 Live traps capture mice so users can decide whether to kill them or let them go.With live traps, you have to check them often so mice do not die if left inside for long periods. Some traps consist of plastic or other recycled materials like paper rolls, buckets or glass. Glue traps are ideal for indoor mouse control. They use no chemicals or poisons.The design comprises a plate lined with sticky glue that holds mice in place when they touch the surface. Some mice can stay stuck and remain alive while on the trap and it’s hard to get out.You don’t have to use bait with glue traps. 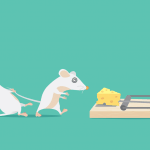 Users can opt to release the mouse by loosening it with a little oil, or they can dispose of the mouse and trap elsewhere. The design of the trap is a plastic box enclosure with an opening for mice to get inside. You set the bait in a cup or other compartment inside.As mice enter the plate the movement sets off the trap door. 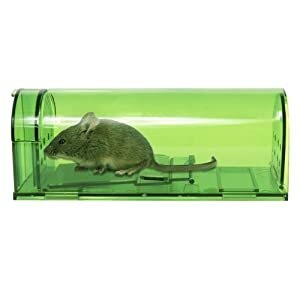 The door will close instantly and hold the mouse inside until you release it.When setting the trap, keep turning the handle and press it into position. To dispose of the mouse, tip it into the bin or release it away from the house. These traps are safe, hygienic and easy to operate. You don’t have to see or touch the mouse inside the trap. 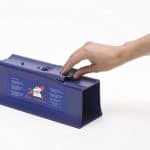 Electronic or battery traps are reusable, durable, fast and highly effective in catching mice.They operate by batteries and set off high volts of electric shocks which kill mice instantly. You place the bait way into the back of the trap, to ensure the mouse gets way inside.When a mouse touches the metal plate, the device releases the electric shock which kills them instantly. The traps are safe to use since they come with safety switch that shields you from shock when the door opens.You don’t have to see or touch the dead mouse if at all necessary. Tip the trap over your garbage bin to release the mouse. You can clean and re-set the trap if you need to. Use gloves when handling your traps and disposing of dead mice. Do not touch the dead rodent as much as is possible. Mice are smart creatures and can pick u human and other rat scent quite easily. Always clean your traps before re-setting them. Keep traps away from children and pets. Make enough space for mouse to get inside, but not leave large trap openings for children to reach inside. Mice are creatures of habit. They frequent the same places over and over again. Set multiple traps and types of bait in and around the areas you notice their activity. Practice pre-baiting mice before you finally set the traps. Set down the bait, and check the mice to see how often they nibble. After a few times, spring the trap and stop them in their tracks. Set your trap with small portions of bait. Do not leave any room for rats to nibble and dash away. Hold the bait in place with string or cotton tips. Place different food items as bait in various locations to entice mice onto the trap. Rats running around your house can cause a lot of damage to your property and livelihood if left unchecked.Most mouse traps are affordable, easy to use and highly efficient at catching and killing them outright. If you don’t like to handle dead rats, you can choose among the various humane traps that let you catch and release them away from your home.